The prices illustrated above are based on the 3x3 stand. All prices are from print ready file supplied and do not include delivery or VAT. 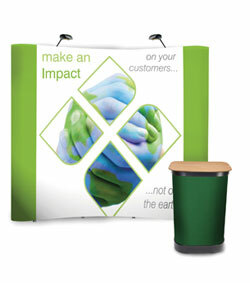 The Impact bundle delivers a complete Pop-up system at a very affordable price. A high quality system that has a massive 8.72m² display area that gets your message across. 3x3 (five panels) or 3x4 (six panels) curved frames. The prices illustrated above are based on the 3x3 inside curve stand. All prices are from print ready files supplied and do not include delivery or VAT. 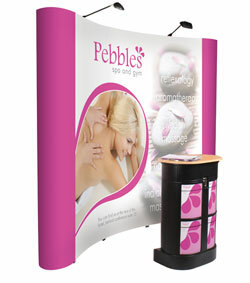 This quality pop-up system is our best seller and delivers a high quality system that can be used over and over again. 3 quad graphic height 2225mm approx. 3 quad midi graphic height 1850mm approx. Above is only a selection of the stands we can offer. If there is not a particular stand you desire or you require more details, either click through to our on-line catalogue or give us a call on 01480 493666 and we will be more than happy to discuss your requirements.